Our Faculty is the oldest faculty of Eötvös Loránd University. The university, founded by Péter Pázmány, Cardinal of Esztergom, was originally launched as a Jesuit university consisting of a humanities and a theology faculty. Our Faculty started academic work right after foundation, on 13 November 1635, and save for a few years of war-induced forced recess (in the 17th century), it has been in continuous operation ever since. In 1667 the Faculty of Law was established. The three-year teaching program at the University of Nagyszombat followed the Jesuit system. The Faculty awarded the academic titles of Baccalaureus, Magister or Doctor. In 1770 the reforms implemented earlier at the University of Vienna were introduced at the Faculty of Humanities, too. The Jesuit university and the Faculty came under state control, and the Faculty was overseen not only by a dean, but also by a Faculty director appointed by the state. Together with the rest of the university, the Faculty moved to the royal castle of Buda in 1777, and relocated to the city of Pest in 1784. The duration of studies changed repeatedly at the turn of the 18-19th centuries, following the Viennese pattern, but at the same time retained its introductory character, which proved an obstacle to obtaining equal status. The language of instruction was Latin until 1844. During the revolution of 1848, a university reform program was developed under the supervision of Minister József Eötvös. The changes implemented in 1850 completely restructured the Faculty of Humanities, which at the time incorporated the natural sciences as well. The introductory two-year course was replaced first with a three-, then a four-year program, and the Faculty gained equal status with the other faculties of the university. Part-time teaching positions were introduced, and a certain number of teaching assistant posts also became available. The student body of the Faculty was initially rather low in number, and although it increased exponentially from the 1860s onwards, the number of students did not exceed 1500-2000 until World War II. The location of the Faculty was unfavourable despite the largescale infrastructural developments in the late 19th century, until it acquired the former building of the technical university (Múzeum krt. 6-8) in 1911. A number of new buildings were erected for faculty purposes in what is now the Trefort Garden. Several plans have been devised for a structural subdivision of the Faculty since 1848, but none have been implemented. The high standard of professionals graduating from the Faculty was ensured after the introduction of the seminar system in 1886. The structure of the Faculty of Humanities underwent no change during the 19th and the first half of the 20th century. The post-war political changes did not leave the Faculty untouched, however. The first major change took place in 1949 with the secession of the departments of natural history, and the foundation of an independent Faculty of Science. Further changes followed due to the imitation of the Soviet higher education model in the first years of the 1950s. The duration of studies was altered to 4 years, then to 5 years for the single and double majors. Following the Soviet model, the Faculty was divided into the Faculty of History and the Faculty of Languages and Literatures. The students and teachers of both faculties took a part in the organisation of the revolution of 1956, and later in the armed struggle. The two faculties decided to reunite in December 1956, a step legitimised by official government consent in 1957. 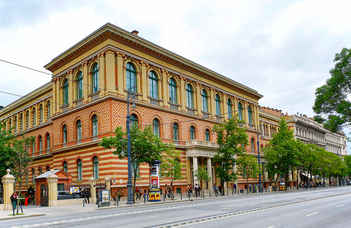 Our Faculty started its relocation to the original campus in the 1990s, where it now functions with 16 institutes and 8000 students as the largest faculty of Hungarian higher education.